He also noted that a rep from the magazine was on a press plane during Barack Obama’s travels to Las Vegas earlier this week. And yesterday the President’s schedule was clear for the day indicating that he may also be featured in photographs alongside his wife. 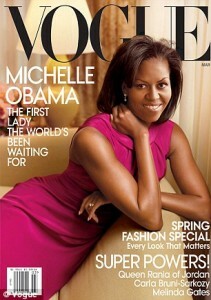 Mrs Obama, 49, appeared on the front of Vogue in March 2009, making her the second U.S.First Lady to do so. The only other First Lady to make the cut was Hillary Clinton, who posed for the December, 1998 issue.